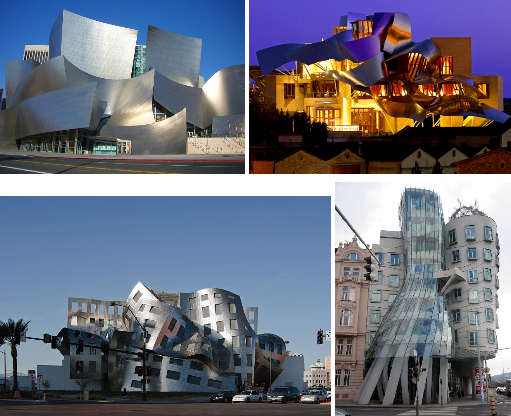 Meet Frank Gehry. 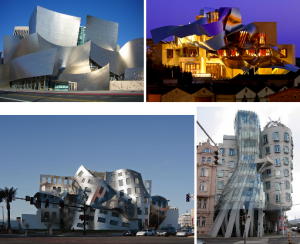 Much of Gehry’s work falls within the style of Deconstructualizm, which is often referred to as post-structualist in nature for its ability to go beyond current modalities of structural definition. This can be seen in Gehry’s house in Santa Monica. In architecture, its application tends to depart from modenism its inherent criticism of culturally inherited givens such as societal goals and functional necessity. Because of this, unlike early modernist structures, Deconstructivist structures are not required to reflect specific social or universal ideas, such as speed or universality of form, and they do not reflect a belief that form follows function. Gehry’s own Santa Monica residence is a commonly cited example of deconstructivist architecture, as it was so drastically divorced from its original context, and in such a manner as to subvert its original spatial intention. This entry was posted in Home on 2014/01/29 by admin. During Eastanbul Westanbul (November 2013), Turkishceramics invited six architectural practices to Istanbul to research and discover the history and use of ceramics in Turkey. During the programme, Istanbul-based design, curator and writer, Gökhan Karakuş presented a lecture to the architects on the origins, historical context and contemporary use of ceramics. To find out more about the insights of the lecture given by Gökhan Karakuş, please read his blog post, ‘Humane Geometries’ – part one of a three part blog series. Please check back here in February for part 2! One of these eastern traditions is the history of the pattern-based approach to architectural decoration often with ceramics as the important aesthetic and material catalyst. Widespread in the Middle Ages in the Islamic world and Central Asia up into the modern period, geometric patterns were used to generate architectural decoration on the facades and vertical surfaces of buildings but were also central to design strategies that were a significant part of the compositional repertoire that was used to build up mass, volume and space. 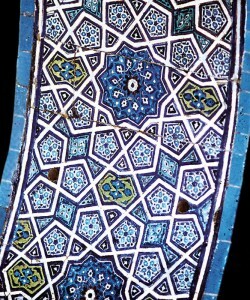 Abstract geometric patterns in two and three dimensions were utilized by architects or more correctly master builders from Istanbul to Samarkand to generate buildings that placed an importance on the practical and the metaphysical in epistemological and architectural concepts different from Western tradition. While the West and Europe was and is still today caught up in its origins in the Classicism of the Greco-Roman period with the classical orders at its center, the East and in particular Islamic architecture focused on a combination of mathematics, geometry, pattern and materials to create architecture. 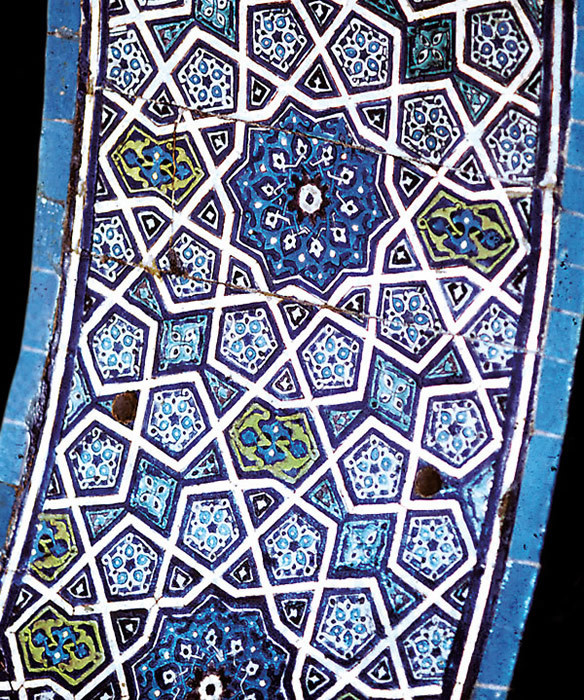 In this non-Western architectural traditional, geometric pattern in the form of non-periodic tilings pointing towards abstract notions of infinity generated a profound understanding of man and the universe in the underlying mathematics behind these designs. It is here in the connection between composition and materials through the application of geometric pattern that we can turn today contemporary practice. While architecture in places like Turkey, Central Asia and the Islamic world is in our times dominated by the Late Modernism of European origin, there exists still in the traditions of construction and materials in the East ways to generate new architectures from a basis in the pattern based design possibilities of materials such as ceramic. Geometric patterns in surface materials and building units extending from the micro to the macro dimensions of building provide intriguing design strategies coordinated with present needs. For example, patterns are a simple way to relate human scale to the vast new urban scale that is growing rapidly in our cities. More so traditions in architecture based in geometric patterns enabled by todays computational design hints at the possibilities of a transformation to an architecture that is at once ancient and profound but thoroughly aligned to contemporary needs for builders and society alike. This entry was posted in Home on 2014/01/17 by admin. 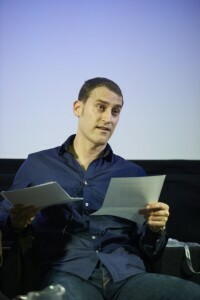 Rory Olcayto named Architecture Writer of the Year. Architects’ Journal deputy editor Rory Olcayto was named the ‘clear winner’ of the prestigious International Building Press (IBP) Architecture Writer of the Year 2013 award, as he picked up the gong for the second time in three years. He was also a participant for Architectural Weekend 2013 sponsored by #TurkishCeramics. This entry was posted in Home and tagged arcitect, blog, design, rory olcayto, turkishceramics on 2014/01/13 by admin. Ceramics have always been a vital part of the Anatolian production tradition for 8000years. Turkish Ceramics Promotion Group strive at reestablishment of this asset of Turkey, announcing to the world the quality and design power of “Turkishceramics” as well. The bright future of Turkish ceramics could already be seen many thousands of years ago and the process initiated in the mid20th century. But the long-waited grand breakthrough came in the year of 1997, when Turkish ceramics companies gathered to form the Turkish Ceramics Promotion Group, under the roof of Ministry of Economy and with the support of Central Anatolian Exporters Union and Turkish Ceramics Federation. 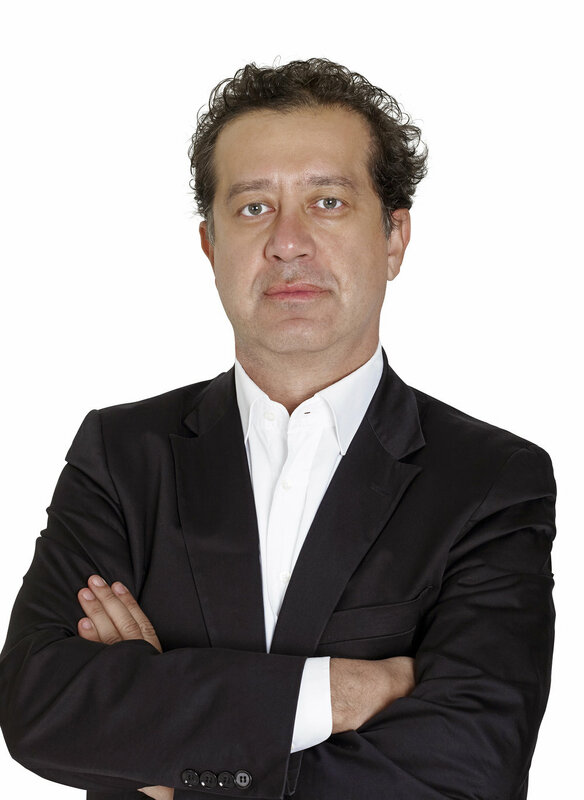 The Promotion Group has set its main goal to raise a premium perception towards Turkishceramics. In this regard, a collective consciousness has been pursued from the beginning. After taking the initiatives in this direction, the Promotion Group functioned asdas a communicator among the participating Turkishceramics firms and this led to easing of the further steps to be taken. The following and the actual motive of the founding of the Turkish Ceramics Promotion Group was to support branding activities abroad to give the main message that “Turkey is the land of ceramics” in order to communicate Turkish ceramics as a worldbrand. The activities of the Turkish Ceramics Promotion Group include many successful events from participating in fairs to organizing events in many foreign countries. In addition, communication campaigns have been used in recent years in order to attract traffic to Turkish Ceramics’ stands at fairs and to increase awareness, create a brand image and ultimately boost the interest in the Turkish ceramics. The mass media communication campaigns have included. The message is, in short: “Turkey is the land of ceramics”. Moreover, the brand of “Turkishceramics” was created, to be the main actor of the ads and editorials to be published in many important international magazines. To strengthen Turkishceramics’ global image, Turkish Ceramics Promotion Group continues participating in international fairs as “Turkishceramics” annually. Besides, elements of Turkish traditions such as Turkish breakfast and Turkish coffee are being promoted as well in order to increase the interest to Turkish culture and “Turkishceramics” booth. Furthermore, famous Turkish artists join the promotion efforts with their breathtaking performances during the international fairs, in order to increase the awareness of Turkish ceramics. This entry was posted in Home on 2014/01/02 by admin.